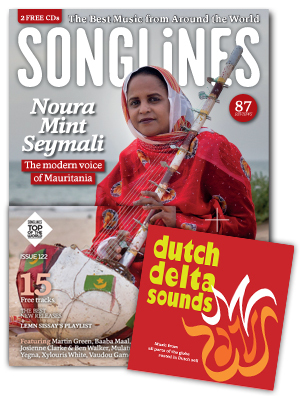 We’re very proud that our music is included on the exclusive Dutch Delta Sounds sampler that comes with the latest edition of the leading British music magazine Songlines! This issue contains an actual summary of Dutch ‘world music’, accompanied by the bonus cd. What the Mississippi symbolizes for New Orleans is the Rhine for the Netherlands. In this delta of Western Europe, on the boundary between land and water, originated a musical more-streamscountry. On the one side influences from Eastern- and Southern-Europe silted, on the other side from the whole world. Via the sea as from the 17e century the Netherlands were connected with Africa, Asia, North- and South- America. More than ever this heritage – an open attitude to absorb ánd to pass on influences from four directions of the wind – colours the Dutch musicworld today. You will find here cross-overs between jazz and pop with music from the Balkans, Surinam, Indonesia and Morocco, but also with influences from the Dutch Antilles, Turkey and Portugal. In short: Dutch Delta Sounds! Amsterdam Klezmer Band, Arifa, Baraná Trio, Boi Akih, Carel Kraayenhof & su Sexteto Canyengue, Combinatie XVI, Fra Fra Sound, Getetchew Mekuria & The Ex, Izaline Calister, Julya Lo’Ko & Erwin van Ligten, Kasba, Maria de Fátima, Mdungu, Minyeshu, NO blues, Oswin Chin Behilia, Raj Mohan and STriCat. For more info visit www.songlines.co.uk.